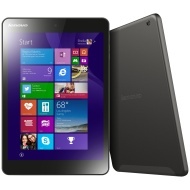 alaTest has collected and analyzed 18 reviews of Lenovo Miix 3 8. The average rating for this product is 3.9/5, compared to an average rating of 4.5/5 for other products in the same category for all reviews. We analyzed user and expert ratings, product age and more factors. Compared to other products in the same category the Lenovo Miix 3 8 is awarded an overall alaScore™ of 87/100 = Very good quality. The battery lasts for an hours use at most. My model has had two motherboard failures in six months. It seems you get what you pay for. In my opinion it would be well worth spending some extra money to buy a different make, as this is not worth it at all. Really pleased with the quality and performance of this bargain product and delivered in 3 days. Plus a year's subscription to Office as well.